Sangat is a term from Sanskrit word ‘saṃgatam’ that literally translated as “a coming together,” referring to an alliance, association, or friendship. The members of the Sangat ensemble use this term to draw attention to the collaborative aspects and cross-cultural nature of our musical fusions. Sangat performs a collaborative raga-based fusion of Hindustani classical, Qawwali, Pakistani folk music, Karnatak music, Middle Eastern music, Western classical and jazz. The musicians share repertoire from these traditions and collaborate to blend aspects from these traditions into new musical fusions. 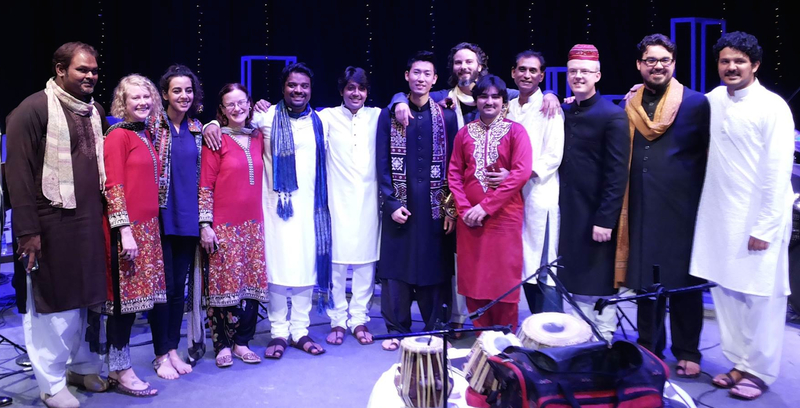 Sangat is a multi-cultural and transnational collaborative music ensemble comprised of members from National Academy of Performing Arts (NAPA) in Karachi, Pakistan, and the Butler School of Music (BSOM) at the University of Texas at Austin. This collaboration has been sponsored by funds from the U.S. Department of State and made possible with the help and support of faculty and staff at National Academy of Performing Arts, Butler School of Music, and South Asia Institute at UT-Austin.